What’s up, everyone, Dr. Dan over here. We’re going to shoot our first, “How to Pulse” video. You can check us out on YouTube as we’re going to shoot a whole string of these videos, so you at home can work through and learn how to develop stronger arm to core to glute connection, run faster, lift stronger and be stronger overall. If you haven’t seen them, these are the WeckMethod Pulsers. 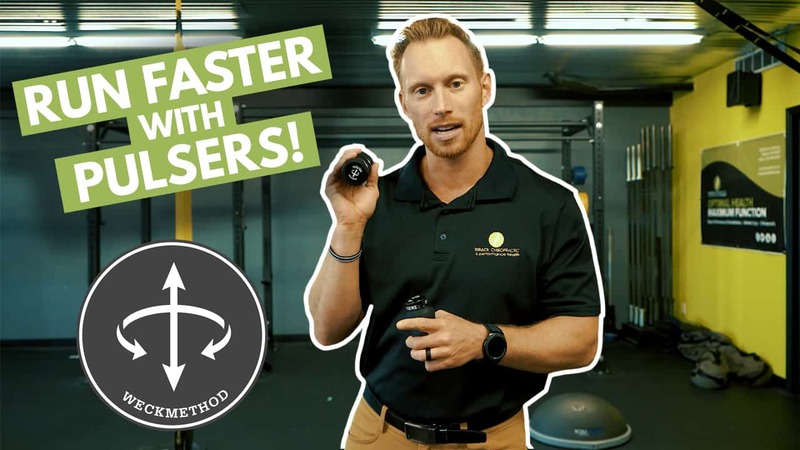 These are the 8oz Pluser and it is a little handheld tool that helps gives us feedback, auditorially, as well as sensory feedback, so we can learn how to create the Double Down Pulse, which is the future of running. This first video, we’re going to go through the initial how to’s. First, there are three little ridges on the Pulsers, we’re going to take our ring and middle finger and we’re going to gently wrap those two fingers around that middle knuckle of the Pulser. We’re going to gently relax the pinky, thumb, and pointer finger. Therefore, when we hold the Pulsers, it like we’re holding a six shooter gun. Imagine being in the Wild Wild West and boom, shooting or pulling a gun. We practice our stance which is very important. The stance that I like to work on with people, patients, and clients is a wrist out, elbows back tucked in, a little bit of a shoulder depression. Before we get into any pulsing, we are going to practice the hand holder, the wrist extensions, and tension down in the lats, and down in the middle of the back. When we pulse or when we learn how to pulse, we don’t want that tension going back up in the neck, we want it to get absorbed by the core, into the lats, and ultimately down through the ground. The ground is going to push back up into our feet and elevate and create that lift in the lats, which are our wings. If you want to lift better, develop a better technique for running, lifting, kettlebell swings, any kind of exercise, these things (Pulsers) will help you out. Fingers wrapped around, wrist out, elbows in, shoulders back and down and that’s the stance you want to practice. Your feet should be wide, tucking your elbowing in, and keeping those wrists in that extended position, making sure you’re not winging outward or the elbows are not flailing outward. Initially, you’ll become comfortable driving the shoulders back and down. Step two, initiate the pulse. All we’re going to do is begin to very slow movement, up to down. When I look down at the Pulser, I want to make sure the cap is staying completely upright. We don’t want it tilting forward, backward or outward. We’re going to in a nice 90-degree angle that is going up and down, up and down. When you learn how to pulse, you won’t be as strong initially as you will after you do 50-200 different reps.
What we want to go for is the setup, which is wrists out, elbows in, head high. We want to really feel the weight transfer up and down as we pulse. We’re going to do this for about 200-500 reps, back and forth, up and down. What we’re going to work on is the depth and speed or the tempo. The depth generally has the hands right down at the hips and we can also work on some deeper pulsing or up higher. Keeping the elbows in and developing that movement and that weight slamming. Step 3 is the speed. Slow at first. Get the pulse. And as we feel comfortable we can increase the speed up and down. Change the height as you do it. It’s cool to put music on and turn it up and try to stay with the beat. Initially, foot position, we’re keeping the feet planted square, but we can also change our foot position to go into a split stance. So, we get the stance, we got the hold, we got the depth, and have the speed. Next thing you’re going to work on is the migrating to left and to the right. So, we got center, left, and right. Alright, now, I recommend pulsing about 10-15, maybe up to 20 pulses simply up and down movements and I’m finding where my sticky areas are at. Stickey areas mean, if I can go up and down, high, mid, and low left with no problem, but right side I have a little more of a difficult time turning to the right. This would be a position that I would want to work to help free up my shoulder blade and to help develop that scapular movement throughout the shoulders and the elbows. In conclusion, we have how to hold the Pulsers, how to initiate the pulse, working on depth and speed. That’s the first video. Hold the Pulsers, stand tall, turn the TV on in your living room and practice the up and down movement, as well as to the left and right. Set a timer on your phone or watch and go for 5-10 minutes, keep the head up, shoulders back and down. That’s the first video on how to pulse! Check back on the second video on learning how to pulse! We’ll see you guys later!